REDUCED. Heritage Texas property with 168 year old planters home. 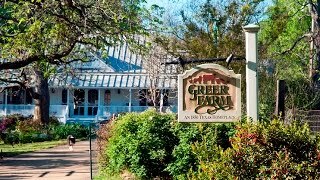 Located in northeast Texas, with 252 diversified acres, the Greer Farm is a well-known farm-stay and agritourism destination. Commercial blackberry and blueberry farm with kiwi trial. The Greer Farm is respected for its world class jelly, jams, honey, beef, lamb, pork, eggs, vegetables, fruits all of which is produced on the established farm. Recreational opportunities include hunting, canoeing, fishing, and over 4 miles of explorable trails. Rentable log cabins overlook the 11 acre lake. This is truly a one-of-a-kind investment. 252 Acres Total (All of which is hog proof fenced). -160 acres in improved Timber production with Loblolly Pine, White oak and native mixed timber. - 81 acres in pasture fenced for livestock. -11-acre fishing and recreational lake stocked with bass (Gillis Home Place). -2-acre mountaintop on south part of property (40 miles of view). -Over 4 miles of trails to explore by foot or ATV. -5,044 sq. foot home built in 1850s and restored back to pristine condition. Original floors and modern appliances with executive kitchen, formal dining, master suite, safe room and many other amenities upon request. -Four cabins, 450 sq. feet per cabin, built along the 11-acre lake made for weekend rental or guests. Each cabin has kitchen, bathroom and bedroom. -Stand alone industrial kitchen for catering for events on sight or remote that is certified by TDA to produce manufactured goods for resale. -14 x 24 Greenhouse, Storage building and numerous small outbuildings. -Numerous historical buildings including large hay barn built in 1845. -Superb fishing at the lake with boating access. Deer, hogs, duck and small varmint hunting and several bird species for bird watching.